understand the disease. 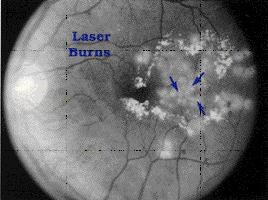 It describes the cause, symptoms, diagnosis, and treatment of diabetic retinopathy. of all Americans diagnosed with diabetes. retinopathy can be saved from going blind. people with diabetes to have an eye examination through dilated pupils at least once a year. people do not notice any changes in their vision. 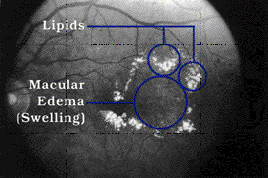 new blood vessels can bleed, cloud vision, and destroy the retina. 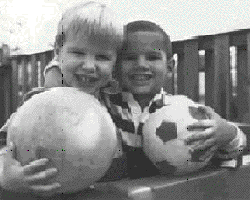 View of boys by person with normal vision. 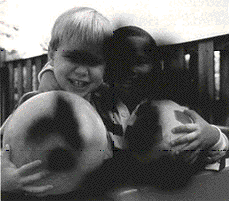 View of boys by person with diabetic retinopathy. in your vision. They often go away after a few hours. remain blurred for several hours. 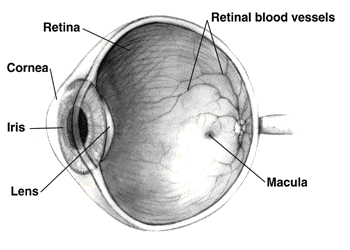 bright light, looks through a special magnifying glass and gains a wide view of the retina. sign of glaucoma, another common eye problem in people with diabetes. blood vessels, (4) damaged nerve tissue, and (5) any changes in the blood vessels. blood vessels in the retina. This test allows your doctor to find the leaking blood vessels. they get treatment before the retina is severely damaged. are very successful, they do not cure diabetic retinopathy. behind the eye to prevent any discomfort. sensation that makes you feel a little uncomfortable. your pupils will remain dilated for a few hours, you also should bring a pair of sunglasses. professional can suggest a way to control this. to have laser surgery more than once to control the leaking fluid. During the surgery, your doctor will aim a high-energy beam of light directly onto the damaged blood vessels. surgery is used to stabilize vision, not necessarily to improve it. 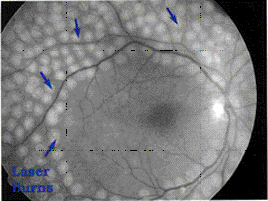 abnormal blood vessels that form at the back of the eye. treatment more than once to protect your sight. vision than someone who waits to have the operation. blindness from a hemorrhage into the eye. removes the vitreous and inserts the salt solution into the eye. days or weeks to protect the eye. You will also need to use medicated eye drops to protect against infection. prevent vision loss in people with diabetes. and reduce the need for laser surgery. The NEI urges all people with diabetes to have an eye examination through dilated pupils at least once a year. If you have more serious retinopathy, you may need to have a dilated eye examination more often. retina. This is called scatter laser treatment. after this surgery to save the rest of your sight.